Bill O’Reilly and Keith Olbermann do not care for each other. Not only do they appear to vehemently disagree over the role of government, and the intersection of media and politics, neither appears to be able to mention the other without disparagement – or in O’Reilly’s case, even mention Olbermann’s name at all. However, there appears to be one significant issue on which they agree, and that is that Ted Koppel‘s recent critique on the state of television news — which indicted the methodology and mien of both Olbermann and O’Reilly — was way off base. Both argued, last night, that they don’t get their facts wrong. Each, however, appeared to miss Koppel’s much larger point. He concludes with a complete condemnation of Koppel, saying that he and those who followed his model of journalism during the Bush era “failed” as they allowed “decreasingly coherent excuses” for the Iraq War to pass under their radar. “When truth was needed all we got was facts– mostly lies, anyway,” Olbermann snapped, claiming Koppel and “objective” journalists were “praying at the altar of the false god of objectivity” when they should have been investigating. Olbermann’s larger point is that “objectivity” is an illusion that has, in today’s post-modern world, morphed and perverted into neutrality. In many respects, cable news audiences (and media critics) have not caught up with Olbermann’s vantage point or astute analysis. 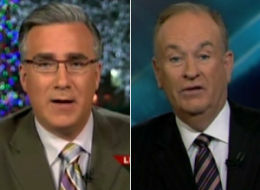 At least most of the time, neither Olbermann nor O’Reilly get their facts overtly wrong. But both are guilty of something just as pernicious: taking phrases and comments out of context and amplifying them for their own political gain. That appears to be the crux of Koppel’s complaint. The fact that neither Olbermann nor O’Reilly are seen as “objective” makes their sometimes important, but always subjective, words often fall on deaf ears. The reason Walter Cronkite and Edward R. Murrow had such impact was because they were seen as objective as opposed to fierce partisans with an agenda. It is true, looking back with rose-colored glasses, at a time that once was, may not serve as a realistic model for a 21st century, But for better or worse, neither Olbermann nor O’Reilly have the objective credibility to have the impact of a Cronkite a Murrow. But in this day and age, Cronkite and Murrow would have lost cable news shows years ago due to poor ratings.